A very useful new feature comes with V2.4 of maaloo Geocaching, the possibility to use ready made map packages from SD-card. If you do not have an SD-card you can import the map files by mail or Cloud. 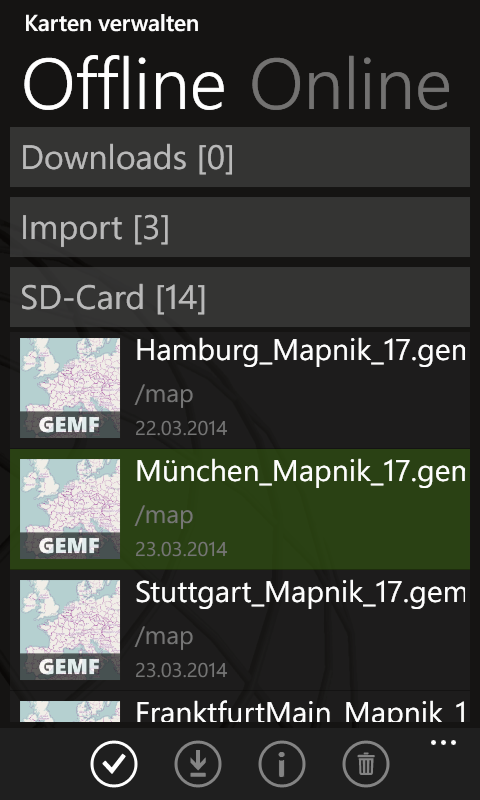 The map files must follow the .gemf-format, known from Android-phones. You can create this map files with the Mobile Atlas Creator (Mobac, format ‘Osmdroid GEMF’) by yourself or download them from other sources. There are some ready made map files in a neat map catalog on this site. The most noticeable visual change is the new map menu. The different map sources are organized in an Online and Offline page with folders to categorize them. You can define as many user defined map providers as you want now. The limit of only 1 user defined map is revoked. the file extensions .gpx and .gemf are now associated with the app. You can open this file-type from mail or file browsers and switch directly to maaloo to import this files. the Go-function now works better with the ‘Navigation HERE’ option. 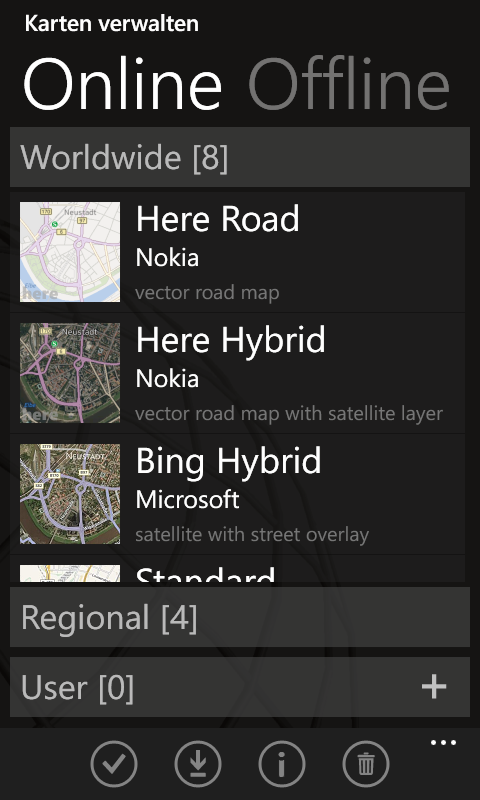 A tap on the 2 or 4 Info-fields on the map opens the map options page to select the content for the fields. This entry was posted in maaloo Geocaching, Update by maaloo7. Bookmark the permalink. 1) The first is just a minor one but still – would it be possible to add also text descriptions to the Attributes icons (in the cache info)? I mean, not everyone knows the meaning of all the icons by heart and it would be helpful to see also the description there – for example after tapping on the icons a new window would open containing both the icons and descriptions for them. (I know, I can tap “view online” and look it up at GC.com, but I would prefer to see the descriptions also when offline, for downloaded caches). 2. Solved mysteries and multis. Now it is possible to create a separate Pocket Query and show this as a Waypoint file, either alone or together with Favorites and online caches. That’s fine, but – I would like to turn off unsolved mysteries and/or unsolved multis, without turning off also the ones from waypoint file (now when I filter off either Unknown caches or Multi caches, these types disappear from the waypoint list, too). Although it is possible to switch between waypoint file (with solved mysteries) and other online caches, it would be better to see them all at once – e.g. Traditional, Earthcaches, Event caches as turned on through filter, AND also any cache types from added waypoint – even Unknown or Multi. Or, an alternative option, maybe even better than the first one – to show the caches from the added waypoint file in another color, e.g. red – so that I would see on the screen green traditional caches, blue question mark for unsolved mysteries, red question mark for solved mysteries, orange multi symbol for unsolved multis and red multi symbol for solved multis (from the added Pocket Query waypoint). Or to add a red circle around the waypoint caches symbols, etc.